The 1970s and early 1980s were years of turmoil. From 1963 to 1969, US President Lyndon Johnson had pursued “Guns and Butter” policies that simultaneously financed an escalating war in Vietnam and his “Great Society” welfare programs at home. Boosted by these expenditures, the economy seemed to boom. However, after a long period when the absence of recession had convinced many economists that the economic cycle had been conquered, the United States experienced a first, relatively mild, recession in 1970. President Richard Nixon thus inherited an economy entering recession and, to maintain the stimulus, he initially followed the same policies as his predecessor. By 1971, however, America’s bloating twin deficits (budget and trade) had made it impossible to maintain the existing system of fixed exchange rates based on a US dollar theoretically convertible into gold. That system had maintained an artificially high exchange rate for the dollar which, in turn, had helped to hold inflation in check. Once President Nixon ended the dollar’s convertibility into gold, the so-called Bretton Woods system collapsed, to give place in 1973 to a new system of floating exchange rates. 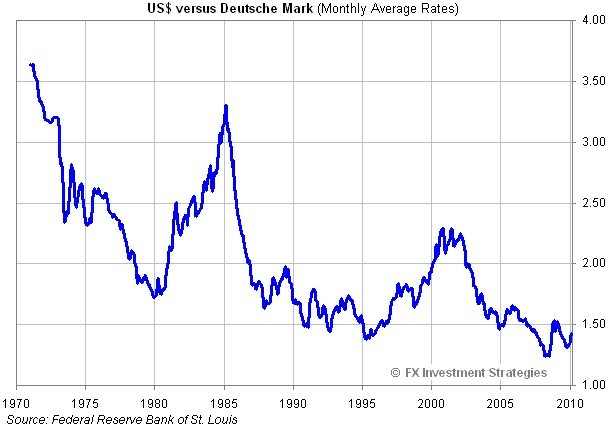 As can be seen below, the dollar lost more than 50% of its value against the Deutschemark between 1972 and 1980. As a result of lax US economic policies, the first signs of inflation actually had begun to appear as early as the late 1960s. But the dollar’s collapse aggravated the tendency and, since oil is priced in dollars, this probably was a factor in OPEC’s October 1973 decision to declare an embargo and to triple the price of oil practically overnight. With this last blow, inflation surged from an annual rate of 3% in 1972 to over 12% in 1974. The surge in the prices of oil and other commodities not only triggered overall inflation but, aggravated by OPEC’s difficulty in recycling to the rest of the world their sudden dollar influx from oil exports, also acted as a severe tax and liquidity strain on the world economy. This triggered a recession in 1975, which not only was severe but, for the first time, was also truly global. Then, after only three years of economic recovery, an Islamic revolution deposed the Shah of Iran in 1979 and triggered a war between Iraq and Iran that lasted from 1980 to 1988. Initially at least, this conflict reduced the flow of oil from both countries and triggered the Second Oil Shock. At first glance, the recession that ensued from the second oil shock in 1980, looks very short and relatively mild on economic charts. But that is due mainly to a mini spending boom on oil equipment and exploration, which only lasted three quarters in 1981. After that spike, it should be noted, oil prices declined for 18 years and the need for oil-related capital spending seemed less urgent. Thus, the entire period 1980-1982 should really be viewed as a one of the longest and most severe recessions in history. 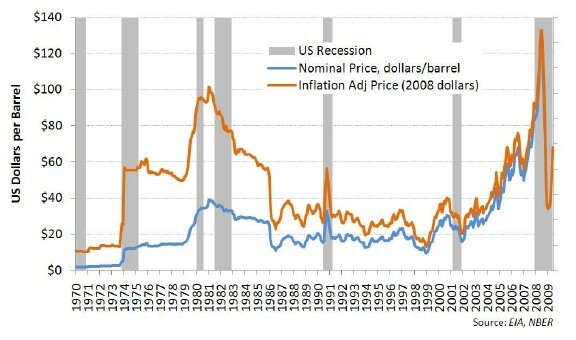 Around the middle of the long, crisis-laden period between the late 1960s and the early 1980s, I wrote for my firm, Tucker Anthony, a paper entitled “Between Inflation and Deflation: The Dislocating World Economy”. The paper described the conflicting forces of inflation and deflation shaping the emerging post-Bretton Woods and post-OPEC economies. It is entirely possible that President-elect Donald Trump will inherit a situation just as problematic as Richard Nixon did in 1969 – at least from an economic point of view. While no one knows much about his detailed economic agenda beyond campaign slogans, there is a good chance that US international relations during his tenure will be more confrontational and, on the trade front, more mercantilist and protectionist than in the last few decades. Trade is not a zero-sum game and if the United States manages to import less, it is likely that other countries or blocs will either retaliate or pursue similarly restrictive policies. Historically, periods like this have resulted in downward spirals for world trade. In turn, periods of slowing or declining world trade seem have caused a slowdown in global economic growth. The above comments derive from my personal experience but in today’s New York Times, Ruchir Sharma, chief global strategist at Morgan Stanley Investment Management, pens an editorial drawing another striking and scary parallel: the period of de-globalization that started with the outbreak of World War I, in 1914. Many regions of the globe are still fighting the consequences of the financial crisis and Great Recession of 2007-2009. Recoveries have remained subdued and uneven. Even in the United States, which by all accounts has had the strongest economy, the recent elections seem to indicate that not everyone feels that they are sharing in the improvement depicted by recent statistics on employment and wages. The allure of protectionism is growing. Sharma argues that the more recent globalization boom, which gained momentum in the 1980s, has been in a retreat that began in 2008 and is still accelerating, with anti-globalization populists having already won control in Britain and gaining momentum in Italy, France and Germany. The likely fallout, he argues, is “slower growth, inflation and rising conflict”. “History doesn’t repeat itself but it often rhymes”, as Mark Twain may have said. Today’s rising protectionist tendencies around the world can only be intensified by Donald Trump’s promised tough approach to international trade and must be counted as a recessionary force in the global outlook. 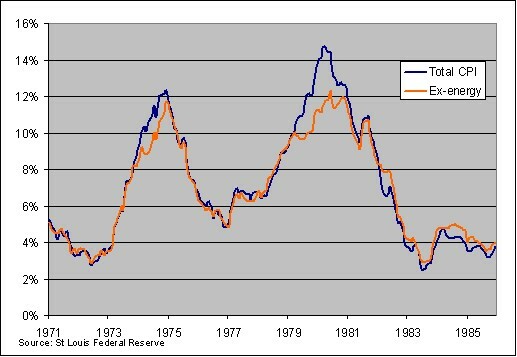 Domestically, to fight any recessionary tendencies and provide employment to those left behind by the more dynamic but increasingly intangible and global economy, Mr. Trump has indicated that he favored fiscal (budgetary) spending and investment over the recent monetary experiments of the Federal Reserve, which he has found ineffective. Tax cuts and spending on infrastructure construction and repair, which will create jobs in older industries, are likely to be favored. While there are arguments in favor of Mr. Trump’s preferred fiscal approach, it also faces potential challenges. First of all, there necessarily will be a time lag between immediate increases in government expenditures or tax cuts and any resulting revenue gains from higher economic growth. In the meantime, it will appear as if the Federal deficit, already large, is bulging further and boosting the already worrying level of Federal debt. I think we can trust the media and the usual pundits to claim early that the new policies are either not working or fraught with dangers. Second, although all sectors and regions are not participating fully, the US economy has been relatively strong. Overall, unemployment is low and wages have recently been increasing. In fact, after much debate and hesitation and presumably remembering William McChesney Martin’s admonition that the role of the central bank is to take away the punch bowl when the party gets going, the Federal Reserve seemed ready to increase interest rates even before the recent elections. Note, however, that monetary and fiscal policies are not independent from each other. A rise of interest rates from today’s very low levels will necessarily increase interest payments on the Federal Debt, which already constitute one of the largest expenditures of the Federal Budget. Another economic uncertainty is the fate of the US Dollar. At the moment, the consensus of professionals seems to anticipate a strong dollar, reminiscent of its performance in the early Reagan years. In this view, fiscal stimulus and a somewhat less accommodating monetary policy in the United States (with the resulting higher interest rates) on the one hand, and weak economies and continued monetary easing in Europe and Japan on the other, justify a run-up in the US dollar. In our view, the likelihood of more protectionist and mercantilist trade policies may lessen the prospects for this scenario. The volume of international trade, nowadays, is dwarfed by the volume of international capital flows, and investment incentives play the greater role in attracting or discouraging capital. Initially, Mr. Trump’s promise of a tax break on the repatriation of corporate holdings held overseas may give a boost to the consensus scenario. But thereafter, the outlook for a closed American economy in conflict with various trading partners may temper that early enthusiasm. No matter who won the elections, the task of the new President was bound to prove very challenging, starting at the end of a long period of declining interest rates and probably on the eve of a long period of rising interest rates. The continued conflict between the forces of inflation and recession will likely intensify somewhat under a trump presidency and we believe that keeping ample cash reserves remains the wise position for investors, especially at current valuation levels.